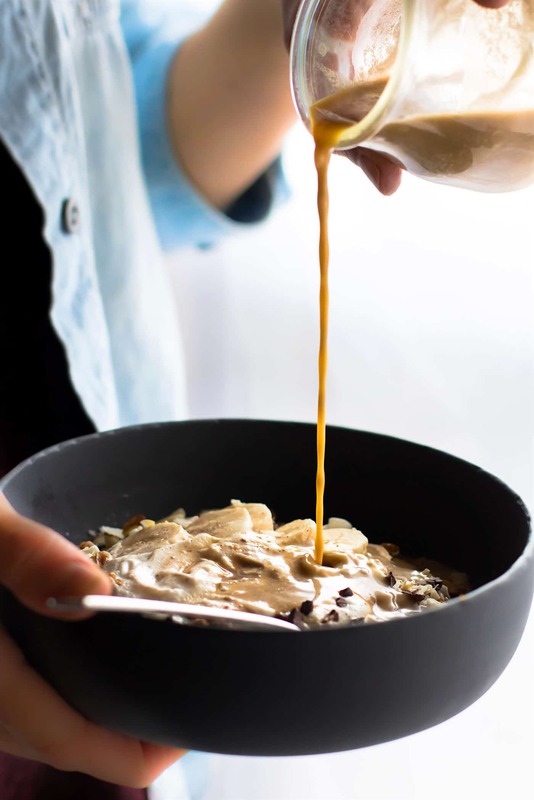 Detox Breakfast Bowls are energy-packed to set your day off right.This Dirty Chai detox breakfast recipe is healthy and nourishing, full of antioxidants, rich spices and immunity boosting nutrients. Gluten free oats, almonds, and quinoa soaked in coconut milk based dirty chai. Topped with dark chocolate and coconut cream. 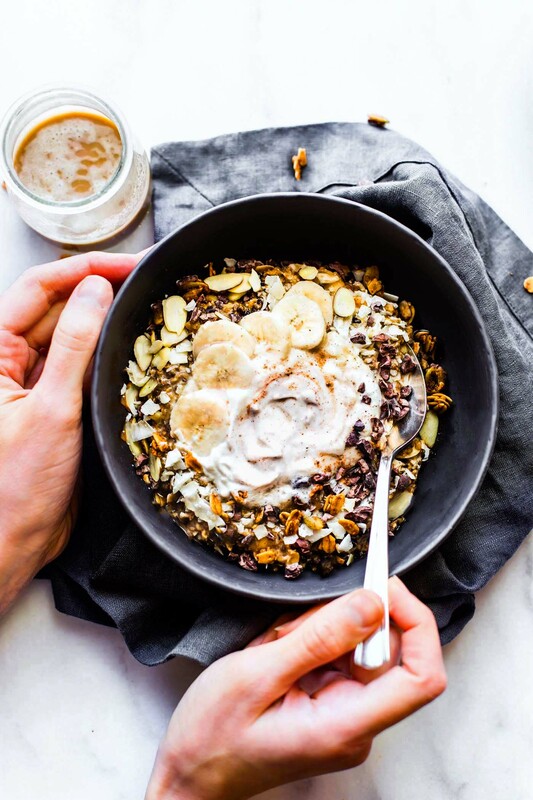 A filling breakfast bowl recipe that will perk you up in no time! Yes, I’m posting a vegan detox breakfast on Halloween! No trick! Hmmm. Not the most attractive sounding breakfast title, but y’all, hear me out. I think you’re gonna like this bowl of goodness! 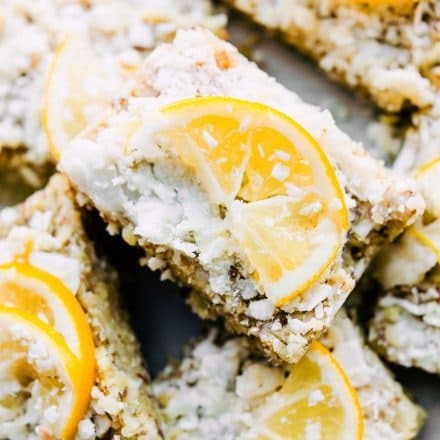 It involves a detox from processed sugar, like say, maybe ….Halloween candy. But it INCLUDES a whole lotta flavor and anti inflammatory nourishment! Give it a chai… haha! What is in a detox breakfast? Before we jump into this devilishly delicious dirty chai detox breakfast recipe, let’s talk about the word detox mmmm k? Oh, how I loathe the word. I really do. But I couldn’t think of a short and sweet word to describe the purpose of this breakfast bowl. So detox breakfast bowls it is! Sure beats “dirty chai breakfast bowls without processed sugar and filled with healthy energizing nutrients” as a title. What foods can I eat while detoxing? Back to my point. I’m going to be using the word “detox” but now you know what I mean. Not an elimination of a whole food group, just a break from the overconsumption of one “guilty pleasure” per se. Yes, that’s called BALANCE. The ebb and flow of Holiday food balance. In other words, no diet is perfect and there is always room for enjoyment. And when that happens, let’s have our GO TO POWER BOWL or Recovery MEAL that can help us get back on track. A nutritional reset. Hence these Vegan Dirty Chai Detox Breakfast Bowls. Filled with ingredients that help RESET and NOURISH the body. In case you are wondering what a dirty chai is, I’ll fill you in. It’s when you use brewed espresso or coffee versus tea in a chai drink. Pure genius I tell ya! Now let’s discuss what’s in the bowl, shall we? *Every one of the spices listed has health benefits. Stress, too much alcohol or sugar, lack of sleep, etc. They all can cause inflammation. ALL these spices are anti-inflammatory, which means they can help calm down the body. I also like the fact that ginger, cinnamon, and black peppercorn can ease digestion or help with nausea. Black pepper supports the pancreas by secreting certain enzymes that breakdown protein/fat during digestion. YES! Needed! Slivered almonds or Dark Chocolate Almonds. – Rich in Vitamin E, healthy fats, and even fiber. 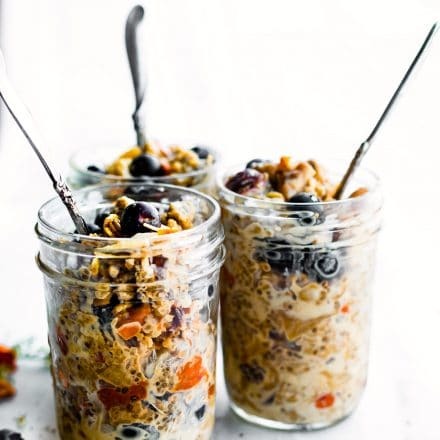 Overnight oatmeal and quinoa (porridge) – Oh how I love overnight oats! An easy way to get more soluble fiber (yet again). But here’s the bonus points part. When you soak your oats overnight, it breaks down certain phytates that can blog nutrient intake. This means you actually ABSORB more nutrients from a meal when you soak your grains. YEEHAW! *Note* Soaking BOTH the oats/grains and the almonds will help reduce the phytates and increase nutrient absorption. YEA BUDDY! Coffee/Espresso – Well it’s just gonna keep up alive. Kidding. Espresso actually contains antioxidants and can protect against type two diabetes. But a little goes a long way ya’ll! And sorry, a Venti frappuccino doesn’t count. GASP! I know. Sorry. Coconut Milk, Coconut flakes, and Coconut Cream – Loaded with minerals and natural fatty acids. 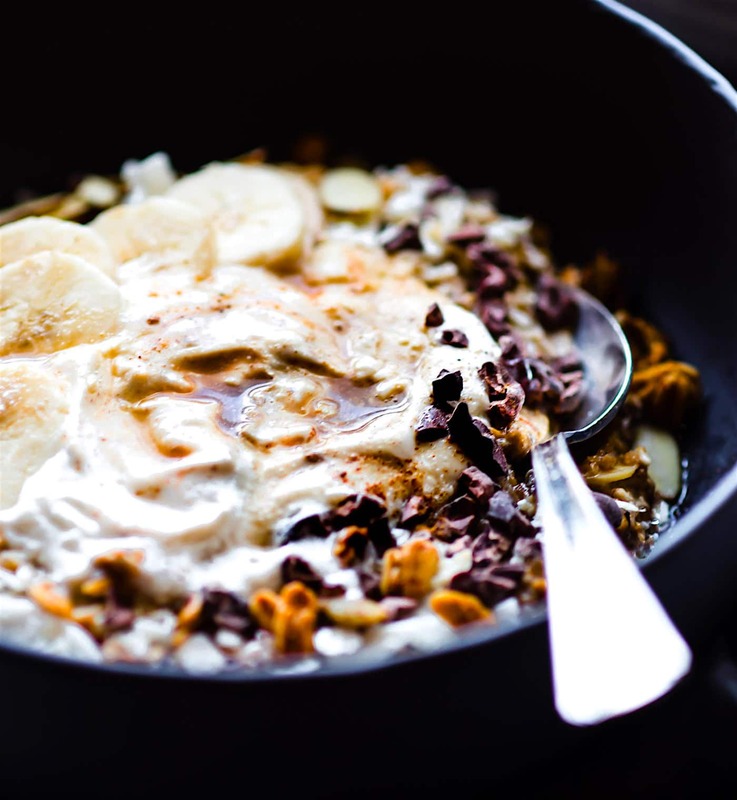 Coconut cream is awesome in breakfast bowls. A little goes a long way with a satiating filling too! Did you know that more mature coconuts have more cream/milk versus water. Yup, good stuff! Cacao nibs or Dark Chocolate – Kinda my new obsession. Yes, ever since I used cacao in my brownies I can’t get enough! Cacao is the purest form of chocolate. It comes from the cacao fruit tree where it makes cacao pods with beans. It is raw and has the highest source of antioxidants of all foods and the highest source of magnesium of all foods. You can also use Dark chocolate almonds, whole or chopped. Same great antioxants and healthy fats! Optional additional toppings –-> Greek yogurt or almond yogurt. Option for organic greek yogurt for a boost of protein! HOLLAH! So you see, that detox breakfast wasn’t so bad, was it? Nope, it’s all about ADDING in the good, and taking a wee little break from the not so good. Ebb and flow ya’ll, ebb and flow. Time to get to the detox breakfast bowl recipe now, mmm k? 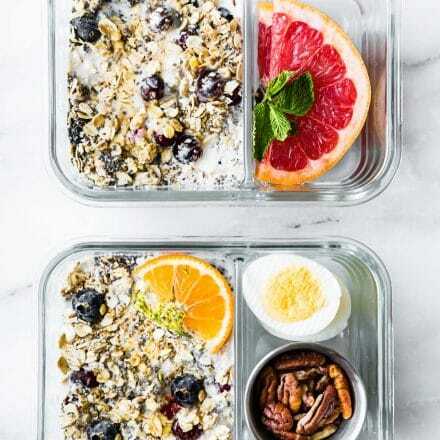 These detox breakfast bowls are packed with antioxidants and protein to kick start your day. You’ll get a boost of energy from the dirty chai made with coconut milk! A gluten free, vegan, healthy breakfast. 1 cup [url] gluten free quick oats ∞http://amzn.to/2ft9xjt[/url] or whole oats if you don’t have quick. First place all your chai mixes in a bowl. Mix together. 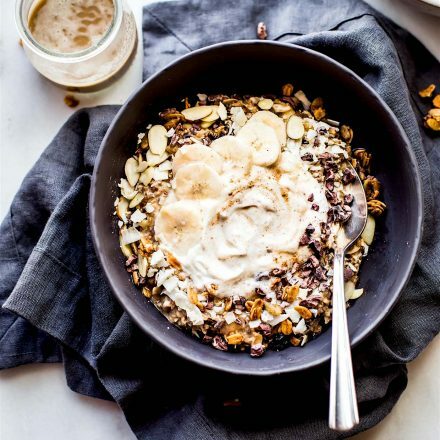 Next arrange your oats, quinoa, and almonds in a large bowl. Stir in your chai mix and maple syrup. Set aside. Heat up 12-14 ounces of almond or coconut milk. Stir in espresso until dissolved. Pour 10 ounces of the milk/espresso over the oats. More if you don’t want any espresso left for topping. I kept 3-4 ounces of the espresso latte mix to pour over each bowl once ready to eat. Place bowl in fridge for 2 hrs or up to 24hrs overnight. Once the “detox” breakfast bowls have soaked, remove from fridge. Scoop 1/2 cup to 2/3 cup into bowls. Add a scoop of coconut cream (the thickened portion from the can of coconut milk) or yogurt on top of each bowl. Pour 1 ounce additional milk espresso mix (latte basically) on top of each bowl to make it a “dirty chai.” Pour the brew hot or cold brew depending on personal choice. Both ways taste great! 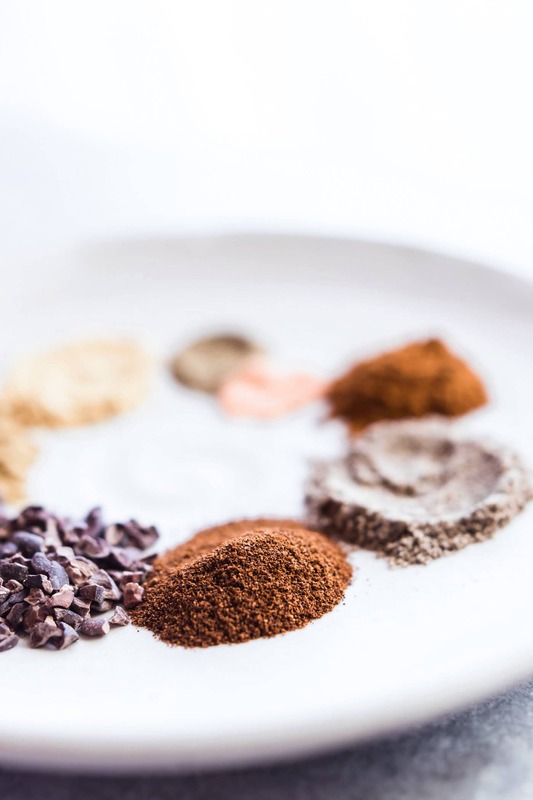 Sprinkle with coconut flakes, cacao nibs (or dark chocolate), and any additional almonds, spices, etc. I kept 3-4 ounces of the espresso latte mix to pour over each bowl once ready to eat. Feel free to add cream or yogurt on top. If you don’t have quinoa, just sub with more oats. You can also replace the instant coffee with cocoa (unsweetened) if you want a decaf version or for kids! I highly recommend the extra topping. It makes the perfect little pod to pour your espresso over! Ya see?! Plus it’s more healthy fats ya’ll! I had way too much fun making the dirty chai detox breakfast bowls. Even more fun consuming them… yes, multiple bowls. Cause that’s how we roll! Layer it up, let it soak, mix, then pour! 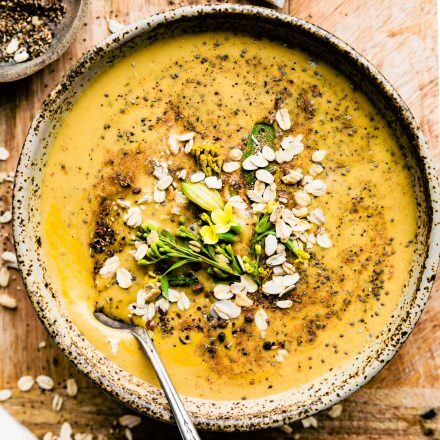 What’s your idea of a detox breakfast bowl? Ever tried a Dirty Chai? I hate the word detox because to me, it is like saying that you would wish a part of your life away, rather than just owning it. I prefer “behavior change,” but I understand it doesn’t have quite the same ring to it! This sounds so warm and comforting! Now if it would just be cooler than 90 degrees I could start eating these kind of foods. Crazy global warming! Yes, this is so satisfying! Thanks, Rachel! I don’t even like chai things, but I am loving the look of this bowl! The taste will live up to the look for sure! Thanks, Rebecca! Who’d have thunk that dirty could be so clean – as in clean eating! My nostrils are assailed by all those warm and oh so pleasing spices in this bowl of dirty goodness! Happy Halloween to ya friend! LOL! love that irony. So the clean/dirty pun I was going for. Mahahahahaha! How did you know I needed a little detox after this weekend? Oops… flip cup is so fun though… HA! If I hadn’t just thrown out that last bit of Forbidden black rice I’d be making this for breakfast tomorrow…however it looks so good I think that might be reason enough to make some rice. That looks & sounds amazing & love all the flavors in it!!!!!! Right there with ya! Thanks, Kristy! LOL! Yes, just for you!! ? Haha!! Yes, so much to love in this bowl! Dirty Chai and oatmeal! Two of my favorite foods. This just went on my must make soon list! First of all, this sounds so delicious! And secondly thank you for giving an alternative to the coconut in the recipe! I’m allergic to coconut and it seems to be in every recipes these days with no subs for it, so thank you again for the substitution. LoL! I don’t get how anything containing espresso classifies as a “detox” food item, but I love it! — Is there any way you could decrease the number of ads, resize images – smaller – and get to the recipe sooner so we don’t have to scroll for hours before getting to the recipe? – Might die of hunger before we get there. Oh sorry, I really try to limit my ads. They are part of my income though. What you could do is click on the “jump to recipe” right below my title of the post. It takes you straight there so you can skip the post and ads. Does that help? Keep me posted! Thank you! Oh ma LAWD. If this is dirty, I don’t wanna be clean! XD I must must must get my hands on these bowls! How long can je save the soaked oats? anywhere from 2 hours to 24 hrs. Hope that helps! After they soak overnight, can i eat them the second day? 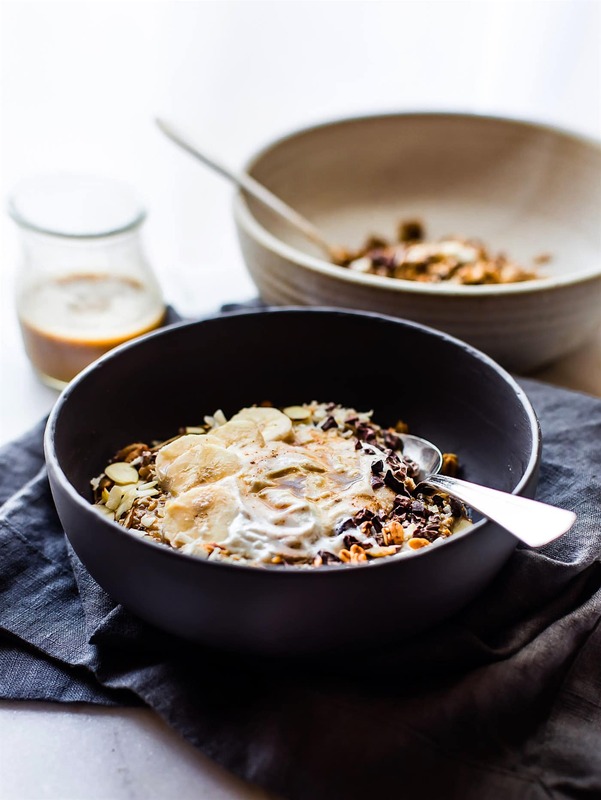 Well, you can’t go wrong with chocolate – coconut- oats!! THIS IS A FIVE STAR RECIPE PEOPLE!! 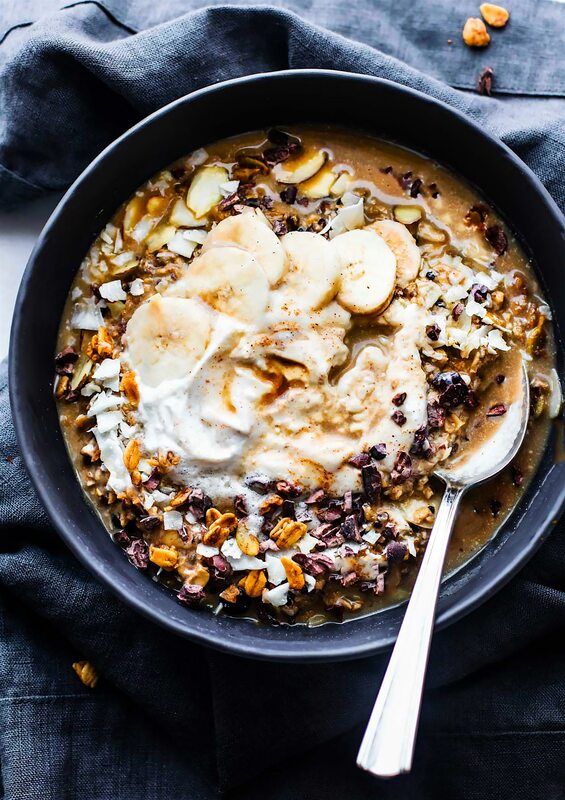 I have tried many, many different overnight oatmeal bowls that all leave me cold (& often leave half still in the bowl) but THIS recipe is the first one that is so dang delicious I can’t wait to get out of bed and eat breakfast! I really can’t say enough about it – you MUST try this! Well done Cotter!! Oh thank you Alison! That means the WORLD!